Program TSO’s program addresses the challenges by providing solar electricity to off-grid villages and “green” internships to promising youth. 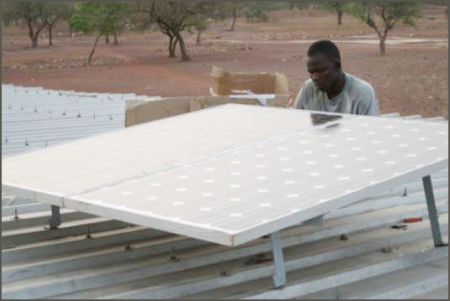 The goal of TSO’s Solar Energy Program is to equip schools in remote communities (currently in Burkina Faso) with solar panels, thereby providing them safe, clean and reliable lighting and electricity. This gives teachers and students the opportunity to use computers and projectors (and, possibly, access to the Internet). TSO also provides solar lanterns to loan to students and teachers, extending their learning and teaching hours into the evening. By enhancing the learning experience, we increase the academic performance of students and their likelihood of pursuing tertiary education. (Children who stay in school usually graduate, earn more money, become more engaged in their communities and are more likely to raise children who will also graduate.) Also, teachers are more likely to be retained in conditions where there is light and electricity available, giving them new opportunities for success and professional development through enhanced teaching tools. As part of this program, we are offering “green” internships to local youth. The “Oak intern” is trained as a solar energy technician (by the local solar energy company contracted to complete installation at the school) and is responsible for maintaining the solar installation in the school. Our goal is to set the Oak intern on the path of a meaningful and stable career. Youth with real-world experience are much better positioned to become financially self-sustaining, either by securing a full-time job, or by launching a new venture. We encourage our Oak intern graduates to “pay it forward” to their communities and become role-models to other young people. Secondary beneficiaries of the Solar Energy Program are the families of the school’s students, staff and the broader communities. Solar lighting and electricity can provide a very important social function, allowing the community to gather safely after sunset for recreation, furthering education, and community business. And when the quality of education of a generation is improved, the whole community benefits economically and socially. Select Village: After consulting with village officials, our local Oak Leader (project coordinator) recommends villages to TSO as candidates for a solar energy installation. Select Supplier: After issuing an RFP and reviewing bids from local solar equipment suppliers, the Oak Leader makes recommendations to TSO management for approval. Once approved, the local company and TSO sign a contract for the procurement and installation of the solar energy panels. The local company also agrees to provide a six-month “green” internship to a local youth. Select Oak Intern: The Oak Leader searches for “green” internship candidates (Oaks) and makes recommendations to TSO. TSO management approves candidates and facilitates a six-month contract between the Oak interns and the local suppliers who will employ and train them. Manage Installation Project: The Oak Leader monitors the solar energy project to ensure it is completed on time, on budget and in accordance with the specifications of the project. When the project has met all the requirements, the Oak Leader pays the supplier for services rendered. Supervise Internship: The Oak internship begins when the installation project is complete. The Oak Leader monitors the progress of the Oak intern and provides him or her with a monthly stipend. The Oak intern’s employer provides a monthly progress update to the Oak Leader, identifying the Oak’s key learnings on the job, as well as areas for growth and improvement. When the six-month internship is complete, the Oak Leader supports the youth in obtaining gainful employment or going back to school. Maintain Installation: The Oak intern is responsible for the upkeep of the solar installation for a period of up to three years. If the intern finds employment (or attends school) outside of the community, and is unable to personally do the maintenance, he/she must train a local youth to take over the project. Monitor for Long-Term Success: The project is monitored by the Oak Leader for up to 3 years, post-installation. Success is measured by the project’s community impact, its effect on student learning outcomes, and ensuring the equipment is functional and well-maintained. Businesses: Wherever possible, we support local economic development by using local resources and building relationships with local solar energy suppliers and vendors who, in turn, hire local community members. Suppliers are paid fair trade market rates and workers are paid a living wage reflective of their country’s wages. Management: One of the keys to TSO’s success has been its Oak Leaders. The Oak Leaders speak the local language and possess local knowledge, both of which are required to assess the needs of their communities, screen qualified Oak applicants, identify and resolve issues with projects and suppliers, and monitor and assist Oaks to ensure their success. Community: Village and school leaders are fully engaged throughout the entire project lifecycle, including planning, implementation, ribbon-cutting ceremony and ongoing operations and maintenance. Under the supervision of the village leaders (e.g., the mayor and school principal) and the Oak Leader, a local village youth (Oak) is trained to ensure the solar equipment is maintained and operational.